Key Takeaway: ISIS’s most complex ground assault outside Iraq and Syria to date occurred in northern Sinai on July 1, suggesting the expansion of ISIS’s ground warfare to the Near Abroad. Previously ISIS’s attacks patterns across the region had primarily featured notable spectacular attacks. ISIS likely seeks to reduce Egyptian security force positions in the Sinai in order to increase its freedom of maneuver as it escalates to more aggressive campaigns, potentially involving international targets such as the Multinational Force and Observers (MFO) based in Sinai. Further, it will contribute to increasing levels of violence in Egypt, where the Muslim Brotherhood continues to undermine President Sisi’s legitimacy two years after Mohammad Morsi’s ousting. ISIS’s Wilayat Sinai launched a wave of simultaneous attacks on July 1 targeting as many as 21 Egyptian military and police positions in North Sinai, focused primarily on the city of Sheikh Zuweid. Nearly eight hours of clashes between the insurgents and Egyptian security forces left several dozen dead and more wounded by some estimates. Conflicting reports among local media, Wilayat Sinai, and the Egyptian government obscure the exact death toll. ISIS’s operation included simultaneous ground assaults on Egyptian military positions and three suicide bombings targeting checkpoints in Sheikh Zuweid and allegedly the officer’s club in al-Arish, although there has been no confirmation of any suicide operations in al-Arish. The Egyptian military, backed by F-16 fighter jets, eventually forced the insurgents to withdraw from Sheikh Zuweid. ISIS’s Wilayat Sinai immediately claimed responsibility for the attack, declaring it used heavy and light weapons, RPGs and mortars, guided missiles, and air defense weapons to force away Egyptian aircraft from the locations under siege. The statement released by Wilayat Sinai also asserted its responsibility for launching three suicide attacks. ISIS’s offensive in Sheikh Zuweid followed a concerted effort by Wilayat Sinai to drive Egyptian security forces from the area; however, it signals a distinct evolution in capability and objectives for Wilayat Sinai since its establishment in November 2014. Specifically, the attack occurred after a recent series of house-borne improvised explosive devices (HBIEDs) targeted Egyptian security personnel over several preceding weeks in June 2015. HBIEDs targeting security forces for intimidation ahead of coordinated assaults against nearby military positions was a tactic used heavily by ISIS in Iraq in late 2013 before the fall of Mosul. The appearance of these tactics in Sinai suggests that ISIS is exporting its ground warfare to affiliates such as Wilayat Sinai in the Near Abroad. Wilayat Sinai’s demonstrated tactical proficiency in the complex attack on July 1 also reflects that previous operations were orchestrated in preparation, suggesting potential for campaign phasing and other characteristics of ISIS’s ground warfare in Sinai. Wilayat Sinai’s seizure of weaponry from Egyptian military positions in the July 1 attack also follows a pattern of activity wherein earlier this year ISIS militants converted stolen utility vehicles to construct vehicle-borne improvised explosive devices (VBIED) and gain access to locations closer to security positions in order to launch attacks. Overrunning military positions increases ISIS’s firepower directly and also improves ISIS’s freedom of maneuver to expand and orient more sophisticated attacks. 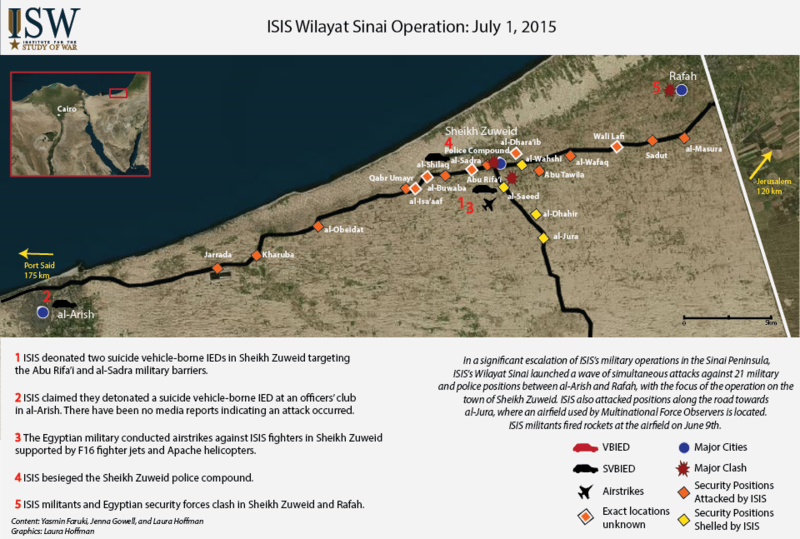 These developments confirm ISW’s assessment that Wilayat Sinai would launch explosive attacks against Egyptian security forces during Ramadan, though the attacks on July 1 reflected a step change in ISIS’s tactics in the Sinai beyond VBIEDS and singleton suicide attacks. Of note, the coordinated assaults on Sheikh Zuweid also occurred two days after an unattributed VBIED killed Egyptian Attorney General Hisham Barakat. His death on June 29 prompted the Egyptian government to step up its counterterrorism campaign, specifically against the Muslim Brotherhood, which it blames for Barakat’s death. ISIS and the Muslim Brotherhood are not assessed to have affiliation, though the overall increase in violence in Egypt will likely strain the Egyptian military’s ability to address multiple threats. The offensive in Northern Sinai on July 1 demonstrated ISIS’s attempt to establish greater territorial control in Sinai and expand its physical caliphate in the Near Abroad. Sinai’s civilian constituency remains largely hostile to the Egyptian government, which plays into ISIS’s strategy to exploit local grievances in order to increase its legitimacy. Though official figures remain unknown, the Egyptian government’s targeting of ISIS militants on July 1-2 may have indiscriminately killed civilians, adding further scrutiny to its counterterrorism campaign and angering Sinai’s residents. These developments are consistent with ISW’s Ramadan forecast, anticipating that ISIS’s affiliates many attempt to administer governance or claim territorial control as a means of proclaiming caliphate expansion and to prepare for future military operations. In light of recent territorial losses in Derna, Libya, it appears ISIS may pivot to Sinai as the primary battlefront in the Near Abroad, which ISIS leadership may capitalize upon to emphasize regional strength. Recent events in Northern Sinai make Egypt’s overall security situation more precarious, enabling ISIS to pursue its objectives more aggressively in the Near Abroad over the course of Ramadan. In addition, a consolidation of ISIS’s territorial gains in Northern Sinai would establish freedom of maneuver within close proximity to international military contingents stationed in the Sinai, including several participants in the anti-ISIS campaign led by the United States. Notably, Wilayat Sinai attacked the Multinational Force and Observers (MFO) base at al-Jura on June 9, signaling a major shift to targeting international forces that may become more vulnerable if ISIS succeeds in disrupting Egyptian security forces in the Sinai. The offensive may also enable Wilayat Sinai’s access to the Gaza strip, where ISIS supporters recently threatened to overthrow Hamas in a statement on June 29. Though the involvement of ISIS’s militants in the Gaza strip in the July 1 attack may be nonexistent, Israel responded swiftly to the July 1 attack by closing two border crossings and announcing that the Egyptian government could further increase its security forces in Sinai, contrary to the terms of a peace agreement established in 1979. ISIS’s position in Sinai may therefore serve more than one assessed objective, including regional destabilization of the balance between Egypt and Israel.